Hey mobile musicians this handy little mixer is just perfect for multiple iOS devices in a live situation. It is compact and portable – The perfect way to mix multiple sound sources whenever and wherever you are. 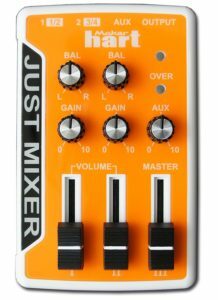 The JUST MIXER by Maker Hart is just as its name suggests, a mixer without bells and whistles. Designed by professional sound equipment makers, the Just Mixer serves to fulfill a need that has not been met till now. Whether a professional needing something simple while away from your equipment or an amateur wanting something simple and uncomplicated, Just Mixer can free you from lugging around cumbersome equipment or being tied to a single location. Be it classrooms, meeting rooms, restaurants, home studios, or anywhere you’d like to perform or set up a recording studio, the Just Mixer makes it possible. With 3.5 mm jacks for input/output, you can connect Just Mixer to your everyday headphone, microphone, MP3 player, mobile phone, laptop, tablet, PC, CD player, etc. You can even use Just Mixer as a sub-mixer to monitor stereo output.